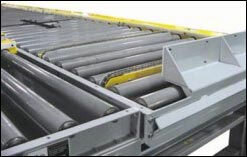 Product conveyed is a plastic pallet; 36 in. long x 39 in. wide x 67-1/4 in. high. Weight ranges from 300 lbs minimum to 1700 lbs maximum. Pallets contain 5-gallon water jugs. 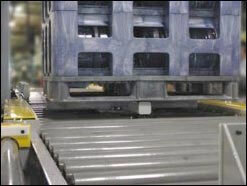 Pallets are moved to a Star Rotator and rotated in 90 degree increments in a full 360 degree rotation. 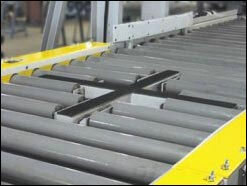 The pallets are aligned to enable lift trucks to move the water filled jugs for loading on delivery trucks. 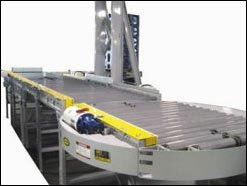 The unit uses a nickel-plated chain due to the fact the conveyor is installed in a water environment. All parts are powder paint coated or nickel-plated. Unit also has a hinged chain guard to allow easy maintenance.